Background: Brassica nigra belonging to the family Brassicaceae (syn – black mustard) comprises of dried seeds and is widely cultivated in Mediterranean region and various other countries like India and Europe. The Plant is neither reported in any official book nor reported systematically for pharmacological effects. Methods: We undertook a structured search of all the official books including pharmacopoeias and ayurvedic textbooks. The data was collected, sorted and compiled to bring the chemical constituents and uses of B. nigra. Results: B. nigra contains glycosinolates which undergoes hydrolysis in the presence of myrosinase enzyme yields allyl isothiocyante. The bitter taste and pungent odor is due to the isothiocyanates. B. Nigra shows various activities that are medically important such as anticancer, anti-bacterial, antifungal, anti-helminthic, protection against renal and hepatic toxicity and can also be used in diabetes treatment. Black mustards are also used in cardiovascular and neurological disorders. 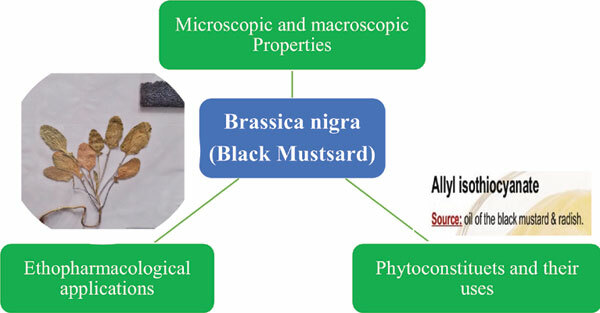 Conclusion: The present review explores the historical background including the macroscopic and microscopic characteristics, chemical constituents, pharmacological action, various evaluation parameters, formulations and uses of black mustard. Anticancer, Brassica nigra, black mustard, allylisothiocyanate, anti-bacterial, anti-fungal, anti-helminthic.